Above: note how different the Giacosa label was in 1967. In many ways, Robert Parker Jr.’s Wine Advocate “bulletin board” — originally launched in 2001! — gave us an early glimpse into how social media would reshape the wine connoisseur landscape and dialectic in the U.S. in this decade and the last. One of the virtual communities that emerged from the board, which was closed in 2010, was a small band of Nebbiolophiles led informally by one of the most wonderful and generous persons I’ve ever met through wine social media, Ken Vastola, a computer and electric engineering professor by day and author of Fine Wine Geek, a blog devoted to chronicling his passion for the wines of Piedmont. Yesterday, Ken and a handful of collector friends — Iggy, Ben, Mark, and Carl — treated me to an extraordinary flight of Nebbiolo over lunch at I Trulli (following my seminar and tasting). 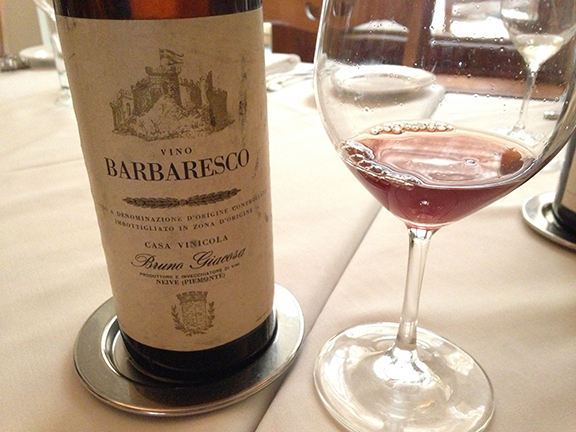 That’s the Giacosa Barbaresco from 1967 (above), my birth year. It had passed its prime, all agreed, but it still had some life in it. I enjoyed it a lot and it’s always fun to have a birth year wine. 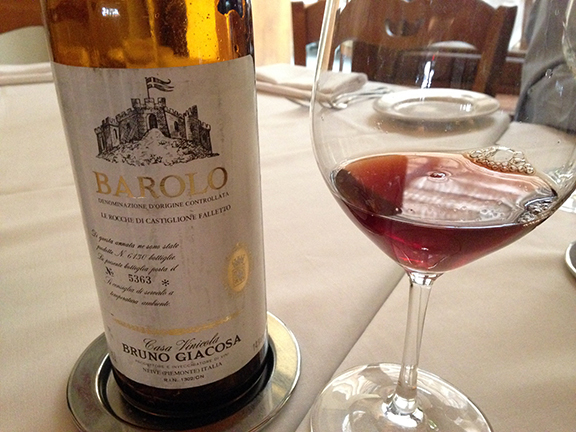 Above: the 1979 Giacosa Barolo Le Rocche di Castiglione Falletto (not to be confused with Giacosa’s Le Rocche di Falletto, a vineyard in Serralunga) was the top wine of the lunch. Man, what an incredibly pure and gorgeous expression of Langa viticulture! I was blown away by its clarity and vibrancy. And it also inspired Ken to utter one of the most beautiful observations on the fine wine tasting experience that I’ve ever heard. 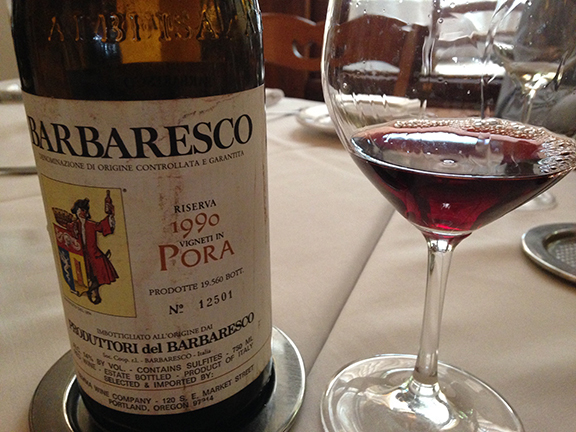 Above: the 1990 Barbaresco Pora by Produttori del Barbaresco. Dayenu! It would have been enough to taste just one of the wines in the flight. The 1990 Pora, at least in this instance, is probably at the peak of its evolution and expression. What a gorgeous wine! As we tasted through the wines, Ken recalled a remarkable evening of tasting and scoring rare and old bottlings of Nebbiolo with a top Piedmont expert and other similarly minded collectors. 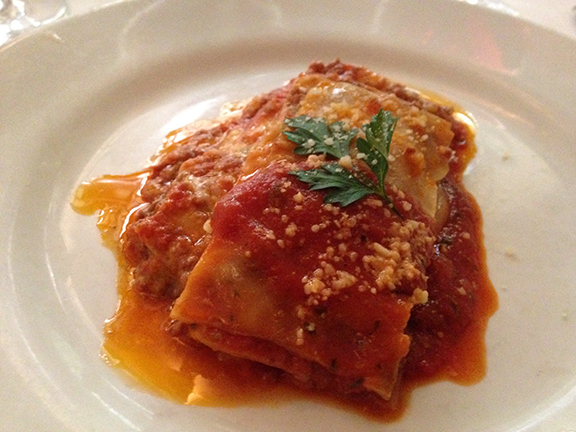 His fellows were surprised when he didn’t give his top ranking to a bottle of Giacomo Conterno’s Monfortino. Evidently, everyone else in the group felt it was the best wine of the night. Above: “Nebbiolo heads,” as Ken refers to his loosely knit band of tasters, can’t live by red alone. 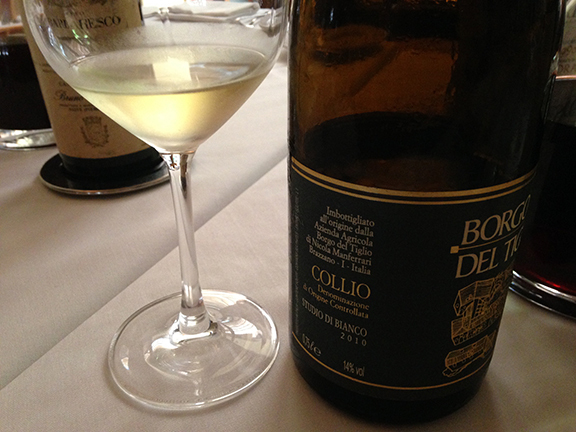 What a thrill for me to taste the 2010 Collio Studio Bianco by Borgo del Tiglio, one of my favorite producers! As it opened up in the glass, it revealed layers and layers of stone fruit and minerality. This will be such a great wine to revisit in 5-10 years imho. Ken’s brilliant and tender observation aphoristically unraveled one of fine wine’s most deep-seated conundra. Let me frame it using language borrowed from the field of symbolic logic: in a finite universe, is there a wine that is superior to all others? The housemade pastas at I Trulli were superb as always. The answer is yes, of course, at least if you believe that the universe is finite. But we mustn’t allow that quasi-mythical wine to elide the wines that we like best. Ken and his cohorts have been so generous in sharing their wines with me. When I thanked the group yesterday, they all told me that they are always looking for an excuse to dig into their cellars and open some of their favorite wines. 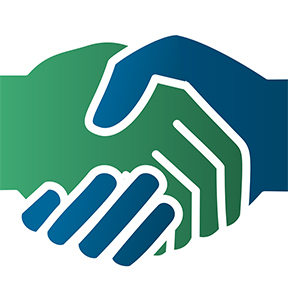 I feel extremely fortunate that I’ve met such generous and gentle souls through wine social media. They taste wines of this caliber every month. I get to do it — mostly thanks to people like them — a couple of times of year. Yesterday, Ken reminded me that the point isn’t to discover the “best” wine in any given flight. The point, as he so eloquently put it, is to taste the wines together and to remember that our favorite wine — like the persons we love — may not be the best wine but rather the wine that we love best. Thanks to Ken, Iggy, Ben, Mark, and Carl, for an unforgettable tasting. What a wonderful experience for me!